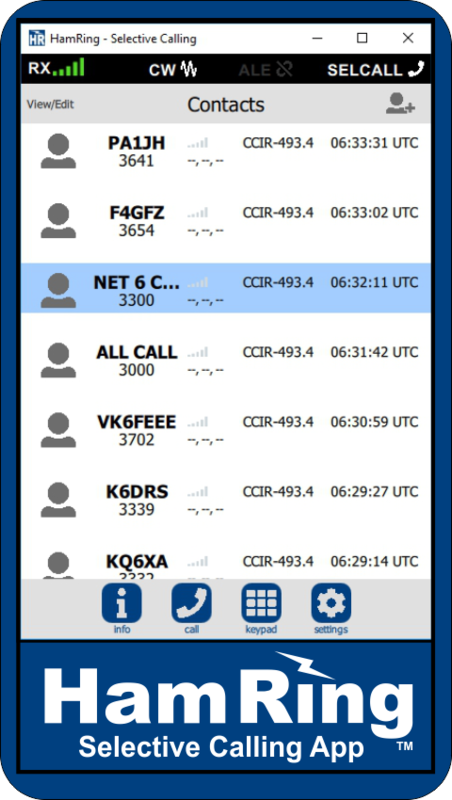 Introducing HamRing, the new app for HF Selective Calling (Selcall). Use it to call your ham radio friends, and it quietly monitors your radio frequency for an incoming call. It works with any HF SSB transceiver or VHF-UHF FM transceiver. Add your favorite callsigns and selcall numbers to the directory. HamRing enables operators to call each other on the air. Send a Ping test call or a selcall. HamRing sends a beep response and alerts the other operator of the incoming call with a ringtone. A HamRing HF-VHF-UHF selcall uses your radio transceiver on a frequency you select. How Can I Get HamRing? A beta version of HamRing is planned for release in mid 2019. The HamRing APP is not available yet. HamRing uses incidental tones for Selective Calling and Alerting. HamRing complies with radio laws and rules. Compatible with the existing Open Selcall standard "CCIR493-4" and "United Nations" Selcall. This type of selcall CCIR493-4 is often built into Codan, Barrett, Icom, Vertex, QMAC, and other HF Land Mobile radios. This type of selcall is widely utilized by Non-Governmental Organizations (NGO) around the world and the Australian-New Zealand 4WD networks. The incidental tones for selective calling are about 1785 Hertz audio frequency. On the phone bands, be sure to announce your own callsign on voice for station ID purposes whenever you transmit incidental tones for selective calling. The HamRing User Group is a forum for users of the app to exchange information and help each other. HamRing will have many interesting features that are not yet implemented in the Experimental Demo Version. It is legal for USA hams to use Selective Calling and Alerting features in the phone subbands to engage in voice SSB QSOs. Selective calling can also be used to start a QSO for texting and data in the data subbands. Does Selcall signal comply with the FCC 300 baud rule? Yes. The CCIR493-4 incidental tones for selective calling are transmitted at 100 symbols per second (100 baud). Does the Selcall signal bandwidth comply with FCC rules? "Incidental tones for the purpose of selective calling or alerting or to control the level of a demodulated signal may also be considered phone." Here are some excerpts of Amateur Radio Service FCC rules allowing the use of SELCALL for Selective Calling and Alerting in the PHONE sub-bands. Please note the last sentence in §97.3(c)(5) which is the definition of Phone mode. §2.201 of FCC Rules define emission type designators. (c) The following terms are used in this Part to indicate emission types. Refer to §2.201 of the FCC Rules, Emission, modulation and transmission characteristics, for information on emission type designators. 5) Phone. Speech and other sound emissions having designators with A, C, D, F, G, H, J or R as the first symbol; 1, 2 or 3 as the second symbol; E as the third symbol. Also speech emissions having B as the first symbol; 7, 8 or 9 as the second symbol; E as the third symbol. MCW for the purpose of performing the station identification procedure, or for providing telegraphy practice interspersed with speech. Incidental tones for the purpose of selective calling or alerting or to control the level of a demodulated signal may also be considered phone." 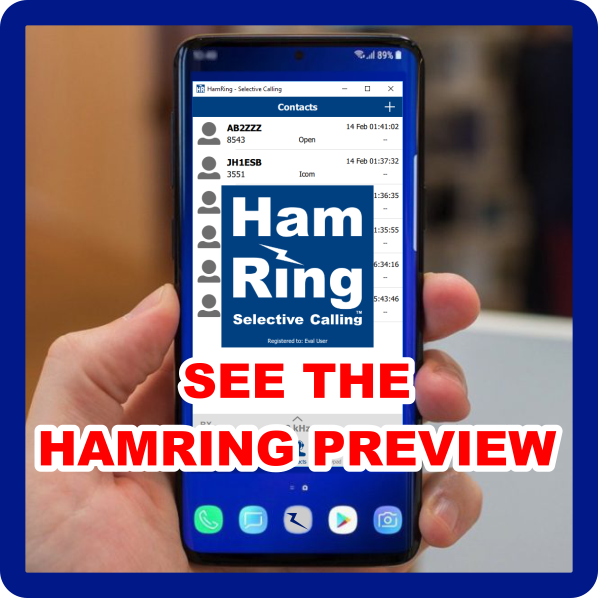 HamRing is a Selective Calling App for High Frequency ham radio Selcall. HamRing uses incidental tones for selective calling.